March 10, 2017, 3:41 PM · Strings come in a set, but many of us don't always string our instruments with the same brand on for string. For example, when I was growing up, I always used Dominants on everything except for the E, which was a Pirastro. More recently, I've used Evah Pirazzis on all but the G, for which I've used Infeld Red for that nice, warm sound. 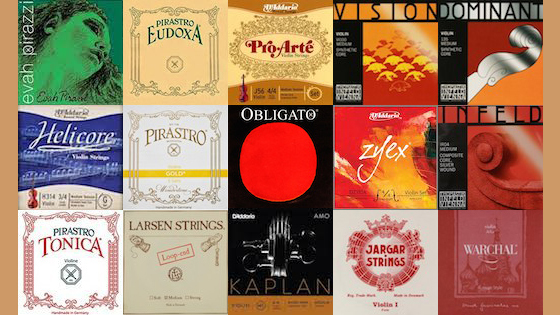 Here is a 2005 discussion we had in which many people listed the strings that famous violinists use, though it's a bit out-of-date because Joshua Bell recently switched from Pirazzis to Jargar Superiors, a new kind of string. Heifetz famously used a Goldbrokat Medium E, plain gut A and D, and a wound G.
Do you mix up the brands of strings that you use, or do you stick to one? And tell us about what you've tried and what you currently prefer! Thank you to Morgan Watkins for this week's vote idea! 1. 1921: E - Goldbrokat medium; A - Vision Solo; D - Peter Infeld aluminum; G - Infeld Red. 2. 1883: E - Goldbrokat medium; A - Passione regular; D-G - Eudoxa stiff. 3. 1869: E - Goldbrokat medium; A-D-G - Infeld Red. March 11, 2017 at 12:55 AM · Have taken to using Kaplan wound non-whistling E with Dominants on my violins although the latter's new tinned Es are nicely brilliant. On my tenor banjo the problem is finding a non-flabby G to go with an E unlikely to break when tuning. Still a work in progress. March 11, 2017 at 02:08 AM · I voted no strong preference, because I haven't given a solo performance for some years now, but if I were going to give one, I'd probably have Eudoxa on G and D, Eudoxa on A if it lasts, otherwise something synthetic, and probably Amber E (if it doesn't blend too badly - It'd be lovely to be without the whistle - and I'm referring to the sound, not the article of clothing). E - Goldbrokat extra heavy (28 gauge), or Jargar Forte if 28 is too much tension for the instrument. March 11, 2017 at 03:29 AM · Stick to one set for each violin. March 11, 2017 at 03:50 AM · I like the simplicity of using a whole set straight across, but I have been known to swap out the E for something better. When I order strings online, I just want to make one purchase, not four separate purchases. I think if the strings in the set don't work well together, than they aren't good strings. March 11, 2017 at 07:13 AM · I use one BRAND but different models... Also I am stringing each of three violins differently. March 11, 2017 at 02:48 PM · Lately, all Helicore; but I want to try Thomastic Vision . . .
March 11, 2017 at 03:13 PM · At present, I have a complete set of Evah Pirazzi Gold on my primary violin. I have the Gold G on that instrument, one of the options with this set, but I am still not absolutely certain that the G has quite the sound I am looking for. It is close though. There is a silver-wound G available in that set and I may try that next. My favorite string in that set is the E which is gorgeous. I have been very pleased with these strings. They stay tuned pretty well after roughly a week of breaking in. I will buy Evah Pirazzi Gold again when I purchase a new set in May. My backup violin is a nice instrument, but played much less frequently. I have Vision Solos on the D, A, and E, and a regular Vision on the G string. It's a fine combination, but it does not excite my violin and I will likely try something else during my next string purchase. I am likely to go with Dominants on G, D, and A, with an Evah Pirazzi Gold E, which I am hoping might give me the sound that I want out of that instrument. For me, the Evah Pirazzi Gold E never whistles and sounds fantastic. If I could find an even better E, I'd buy it, but for now, this is my favorite. Any other suggestions for the world's best E? March 11, 2017 at 05:29 PM · I use a full set of Tonica and I love them for their perfect balance of warmth, brillance and projection. They have a wide range of colours, have worked well on every violin I've tried them on, and they're great value for money. Haven't tried much else, though. I'm very satisfied. March 12, 2017 at 12:21 AM · Note that Shar carries popular sets like Evahs with alternative E strings. So you can get the set price with the Goldbrokat E, for example. I've used Evah Pirazzi for years but based on Ella's recommendation I might try the Tonicas. They're less than half the price of Evahs. Does anyone else recommend Tonicas too? March 12, 2017 at 04:02 PM · Apparently, the E-string in a set is substandard for many people and they replace it by something better. Since the string manufacturers know that, why don't they include a better E-string in their sets? For example Dominant. Is the Dominant E-string really that terrible? (I have never tried it, indeed I have never played with Dominants so far, strange as that may sound). March 12, 2017 at 04:26 PM · Why don't you try. I have never purchased Dominants, which may sound odd. Funny enough, Tonicas were the strings I discovered after using crappy metals for some time. March 12, 2017 at 09:32 PM · My recent delight: A matching set of Efrano gut strings heavy with copper wound G.